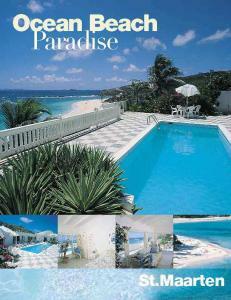 The OCEAN BEACH PARADISE is the most booked villa in Sint Maarten. A few steps from the pool to the one of the most beautiful beaches. Beautiful coral reef with colourful fishes and alive corals. 3-4 airconditioned bedrooms/bathrooms with view to the pool + Ocean. Pond Marina. Two Beach Bars with perfect service are available. placed at your dispense. Inside and outside dining. Gas-Barbecue. and day trips to neighbour islands are near by. St. Maarten / St. Martin has 2 nations - France and Netherlands. or horse back riding, visit the butterfly farm or zoo. Tennis, Golf. or sailing catamaran to neighboring islands. Payment: 25 % on booking, balance 2 month prior to the stay.